Hope student Jenna Buck won third place in the finals of the Opera Grand Rapids Collegiate Competition on Sunday, April 14. She is pictured with collaborative pianist (and 2009 Hope graduate) Emily Chapman Steiger. 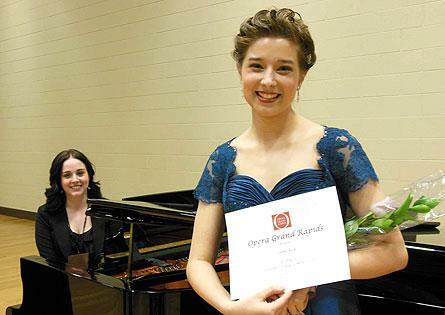 Hope College student Jenna Buck of Elburn, Ill., has won third place in the finals of the Opera Grand Rapids Collegiate Competition, held on Sunday, April 14, at the Betty Van Andel Opera Center in Grand Rapids. She was one of nine finalists competing in the event after being chosen from among 30 singers in a semi-final round held on Friday, March 1. Each contestant performed two arias for the judges and an audience of approximately 250. Judges for the April 14 event were Dr. Rachel Gates Bergan, visiting assistant professor of voice at Michigan State University; Dr. Raymond Harvey, director of the Kalamazoo Symphony; and Paul Mow, professional tenor and director of theatre at Southwestern Michigan College. The Opera Grand Rapids Collegiate Vocal Competition provides an opportunity for outstanding student vocalists being trained full-time at Greater Grand Rapids-area colleges and universities to compete in a professional competition and to be recognized for excellence by a professional opera company. The participating students are asked to perform two arias in differing styles, languages and composers from opera and/or operetta. Buck, who is a 2012 Hope graduate and vocal music performance major who is continuing studies at the college, was also a finalist in the 2012 competition. Active in music performance throughout her time at Hope, she was a featured soloist during the college’s annual Concerto and Aria concert on Friday, Jan. 25, and Musical Showcase on Monday, March 4. In addition, this past November she placed second in the Advanced Men and Women category in the National Association of Teachers of Singing (NATS) Michigan State Chapter Auditions. Accepted into multiple graduate-level programs in music, she plans to pursue her M.M. in vocal performance at Michigan State University. Buck is a 2008 graduate of Kaneland High School, and the daughter of Mark and Cathy Buck of Elburn. She studies voice at Hope with Linda LeFever Dykstra, who is an associate professor of music and chair of the voice division. The department of music at Hope College will host a student quintet concert on Wednesday, April 24, at 7:30 p.m. in Wichers Auditorium of Nykerk Hall of Music. Eighty-four Hope College seniors have been awarded monogrammed blankets for their participation in athletics at Hope.